Welcome to my blog for the Heartfelt Creations April Alumni Blog Hop! Be sure to leave a comment on all the participating blogs. One participant will be chosen to receive a $25 Gift Certificate. The more you comment the more entries you get into the random draw! Be sure the check the Winner Announcement on Sat, April 30th. If you win, please send an email to Emma Lou at EmmaLou@heartfeltcreations.us and write "Winner of April Alumni Hop" in the subject line. Hop ends on Friday, April 29th at midnight. I made this fun layout of my son and I at the park using blues and greens and whites and I LOVE how it came out! The background paper has a lot of sheen so it's hard to photograph. Thanks for visiting and taking your time to comment on my blog! Have a great week! Gorgeous page with a beautiful flower cluster! The photo just makes me smile... y'all were having so much fun it looks like! 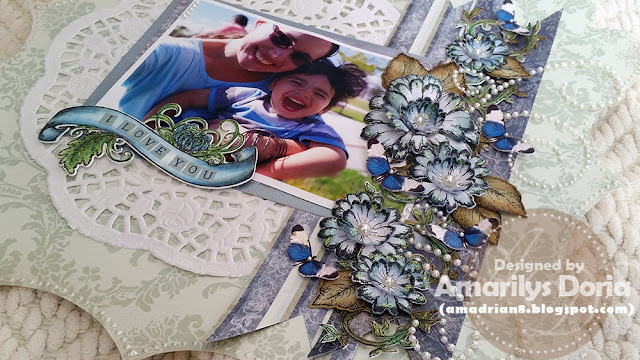 This is a beautiful layout love the choice of dies and stamps you used to create this . I absolutely love this gorgeous layout and the flowers are beautiful! Very pretty, Amarilys. What a beautiful way to showcase happy times. What a beautiful page layout and sweet photo! Love these flowers. Thank you for sharing. Adorable photo!!!! Love the elegant and pretty way you framed it for your LO! your layout is beautiful I love the blues and greens, and your flowers or sooooo pretty. What a beautiful layout. So well done with those gorgeous flowers and the wonderful beads. Hi, some things are timeless...love Heartfelt Creations....love what you do with it...so looking forward to seeing much more of your work. Inky hugs. Such a beautiful layout with the spray of vintage flowers like a trellis down the side! Gorgeous colors and design! Lovely layout with beautiful colors. The photo is wonderful as well and just pops off the page! Love the large diecut. The blue flowers on the side are graceful. So very pretty! You look like you're having so much fun! !